Optimum Security is your best choice for residential and commercial security services in Langford. Our trusted, experienced team can provide a wide selection of security services in Langford to meet any need. We work closely with our clients along with local law enforcement to ensure the very best level of response in any situation. With the best qualified security professionals along with proper training and equipment, we’re confident we can help you with any security matter you need support in. Our security guards in Langford provide ample support for all property, assets, and people. Our team provides protection and handles immediate needs when they arise. However, just their presence at your location can help to deter would be problems. 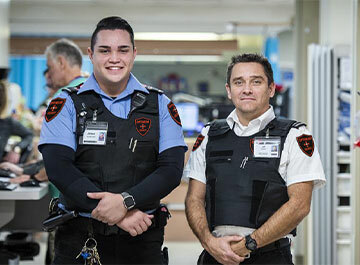 Our Langford security guards have incredible training and education to give you peace of mind. We’re trusted, dedicated, and reliable professionals. Among the services Optimum Security offers is a comprehensive number of security systems and alarms, each designed to provide hands-on support and customized care to our Langford clients. For residential clients, we often recommend alarms for monitoring carbon monoxide levels, fire and smoke, as well as flood and water damage. To provide complete security support, we offer a hands-free, two-way communication system that provides residents with direct access to the supportive services they need as soon as you need them. For our commercial clients, we offer security monitoring with guard services. Our team monitors your business, or even your home, when you are not there, giving you confidence and peace of mind. If you are thinking about the risks in your community, contact Optimum Security to learn more about the options available to you. Let our team work with you to choose the right Langford security services for your needs.